Have you ever packed for an adventure and thought to yourself, “It would be fun to grill up my catch of the day for dinner, but my grill is so heavy and bulky! Maybe I’ll just pack some jerky and granola bars instead.” If this sounds like you, then you and I are one in the same. I enjoy outdoor cooking but was beginning to feel confined to my small patio. My old charcoal grill, although portable, was dense and outdated. Enough was enough, so I commenced the search for a grill intended for people like myself who are always on the move. I came across one that was the brainchild of two Chicagoans who also struggled with irritating heavy grills. Behold! 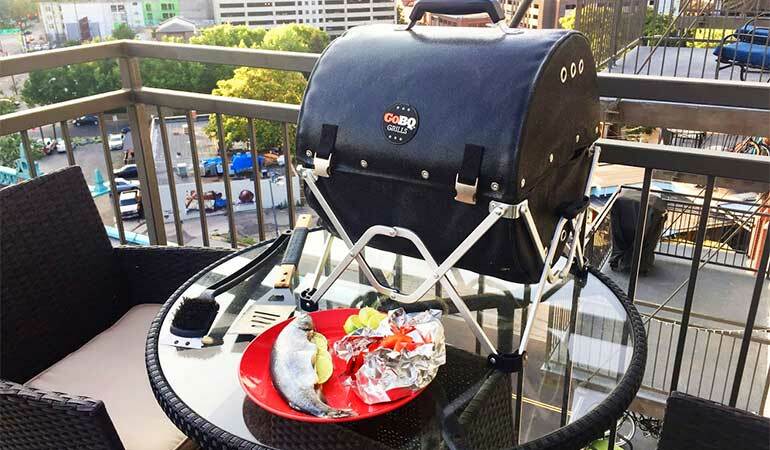 The GoBQ grill – a portable, charcoal grill made of flame-resistant fabric that folds into a compact carrying case, small enough to fit in your backpack. The grill gods had answered my prayers. 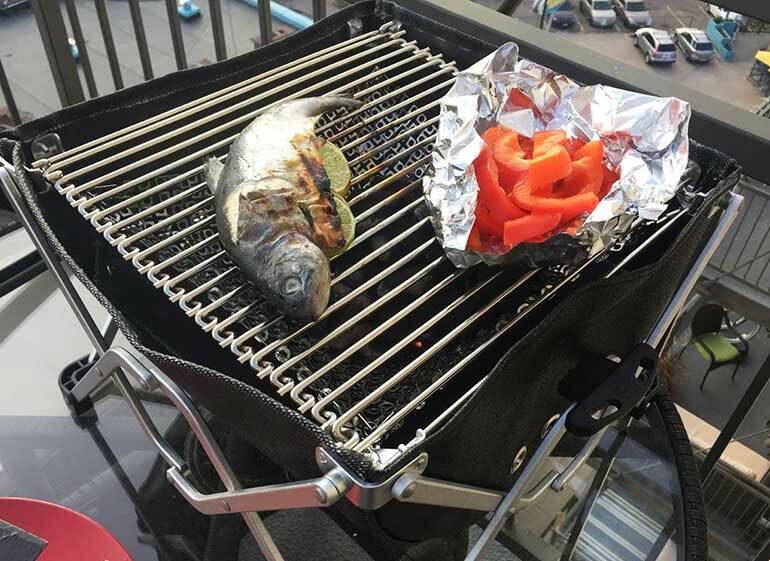 The first time I used my GoBQ grill was on a fishing trip with friends. We set up camp, had a successful day at the lake, and came back with some fresh trout on ice. We were at a dispersed campground with a grateless fire pit, so my friends were grateful (pun intended) I brought my GoBQ. I’ll be honest, I felt like I was showing off when I reached into my backpack and took it out. Everyone’s jaws dropped because no one had ever seen a grill capable of fitting inside a backpack. However, you don’t even need your own bag considering the carrying case/lid combo comes equipped with a shoulder strap. Unclip the two plated-steel buckles to remove and expand the collapsible charcoal basket. Add 24-32 briquettes of match light charcoal or starter cubes/sticks – avoid lighter fluid and chimney starters! 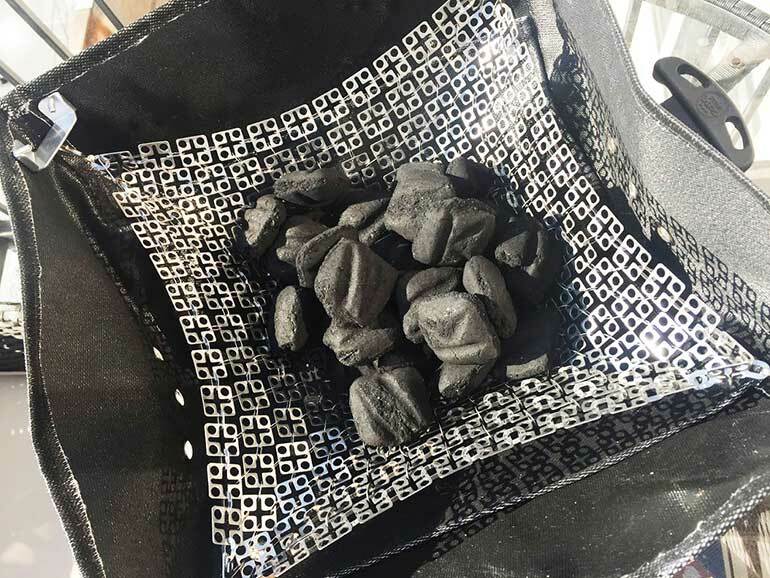 Make sure the base is fully unfolded and there are no folds or creases touching the coals in the charcoal basket. Light your charcoal/cubes and place the roll-up grate atop the grate rests. Cook your food with the lid on to help moderate temperature for best cooking results and to expand the lifespan of your grill. If you’re a Grillmaster or “GIT” (Grillmaster In Training), you might be familiar with the great charcoal vs. propane debate. Propane can be advantageous in certain scenarios, but charcoal offers one huge benefit that propane cannot. Gas grilling does not impart the same smoky, charred flavor that charcoal does. Fish, wild game and vegetables all absorb that delicious grilled flavor with the GoBQ. I wouldn’t consider myself a talented chef, but I’ve enjoyed all meals I’ve cooked on my hip, new cooking companion. The GoBQ’s stylish and easy-to-clean design, quality materials, and (most importantly) its portability, are all what makes this grill unique and worth your money. Ideal for day fishing excursions or extended hunting expeditions, I give the GoBQ two thumbs up and five stars! For more information, and to get your own GoBQ grill, visit GoBQGrills.com.